A fresh and minimalist 7mm titanium band for him, crafted with a matt and polished double groove to add a touch of luxury to his attire. 7MM Titanium Matt and Polished Groove Band is rated 5.0 out of 5 by 3. 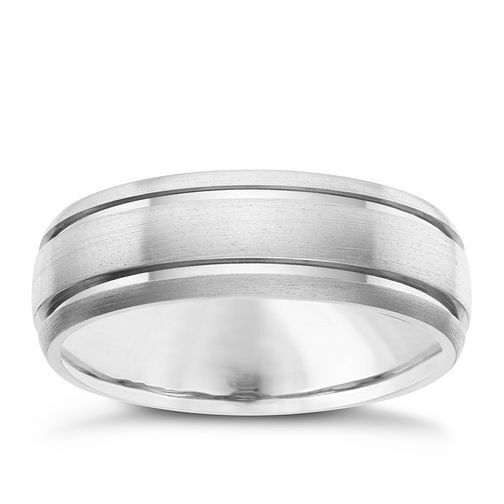 Rated 5 out of 5 by Anonymous from 7MM Titanium Matt and Polished Groove Band I was looking for a wedding ring that looked the part. This Titanium ring is strong and fits really well. Very pleased with he design. Rated 5 out of 5 by Anonymous from Perfect Wedding Ring I browsed many wedding rings for myself, and when I saw this one I knew it was the one. It is a very comfortable fit and the brushed effect looks great with the two polished bands.